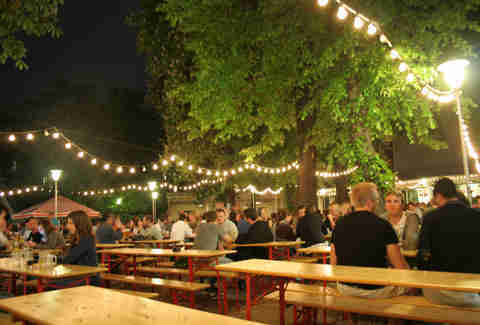 This traditional beer hall with a large garden space is indeed a piece of Bavaria in Berlin’s Mitte. Proclaiming themselves the biggest beer hall in Europe, the 6,000sqft space is decorated with typically Southern ornamentation and garlands and has all the elements of what makes a German beer hall gemütlich (welcoming). You know, apart from the beer. Located near Hackescher Markt U-Bahn station, Weihenstephaner is a Bavarian-style beer hall with a ton of outdoor seating. Traditional Bavarian food such as sausages, schnitzel, and sauerkraut are served with a wide variety of both light and dark top-notch beer varietals. It’s also one of the few places outside Bavaria where you can find the vaunted Weihenstephaner beer. 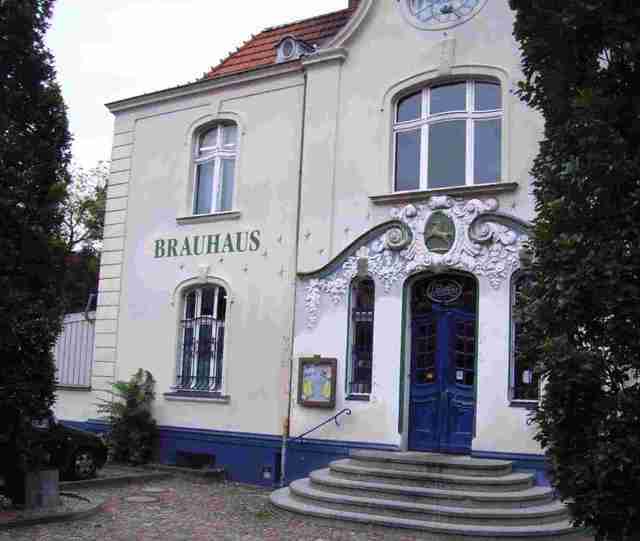 Located off the beaten track, Brauhaus Rixdorf is a brewery that serves typical hearty German food and a selection of rich beer. 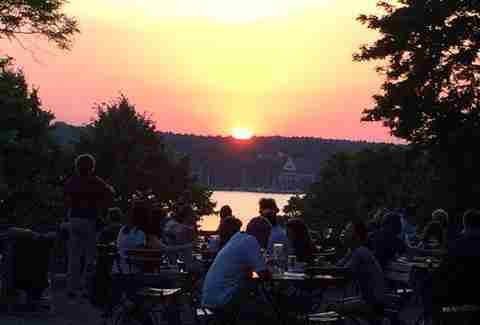 Its large patio, which opens in the Summer, sports a relaxed atmosphere typical of Neukölln. This small brewery and beer hall has a beer for every season, ranging from pilsners to dunkels and hefeweizens. It is tucked away in a cellar of an apartment building in Wedding, behind a student dorm, and has a pretty gorgeous garden that takes up a large portion of the courtyard. 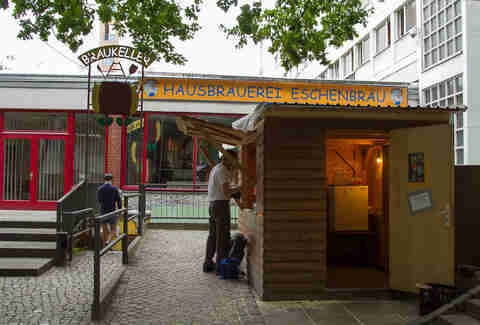 During Summer months, you can get your beer and Bavarian snacks from a small outpost in front of the cellar, too. Prater is Berlin’s oldest beer garden, and has boozily seen through Prenzlauer Berg’s various transformations over the decades, both before and after reunification. 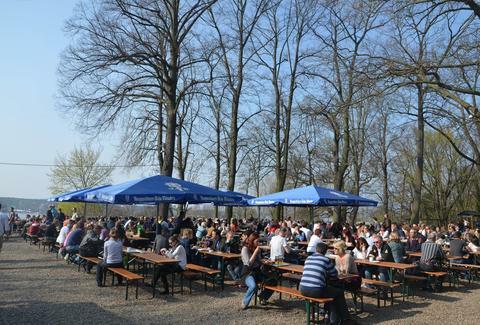 It has a vast yard and picnic-style seating, shaded by chestnut trees, while homemade Berliner cuisine is complemented by a selection of local beers, including light lager (Prater Pils) and darker numbers (Schwarzbier). This picture-book gorgeous spot overlooking a lake is a popular destination for walkers and hikers, particularly in the Summer. Food-wise, they're famed for their Leberkäse (a type of meat loaf popular in Germany and Austria) and pretzels, to be washed down with their plentiful drafts -- and as much as we don't want to condone drinking & boating, you can rent a boat and take it out onto the water, too. 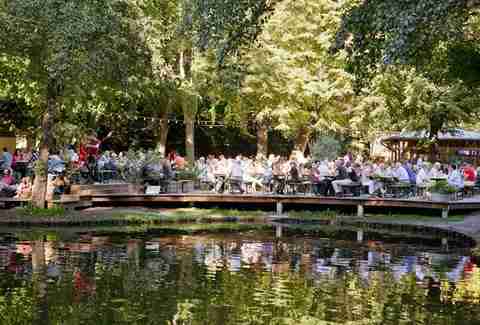 Located on the outskirts of Berlin, this traditional beer garden is famous for its scenery and an exceptional selection of beers. Authentic Bavarian beer is served with peppers, pears, bacon, or dried tomatoes, BBQ pork knuckle, apricot dumplings, and other Southern specialties. 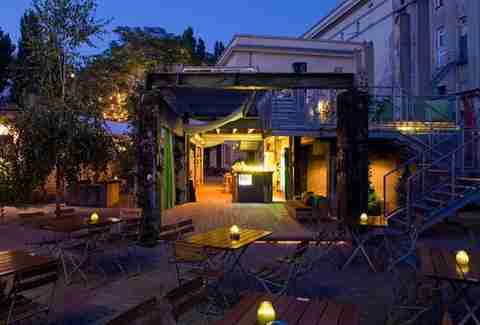 Nestled next to Berghain’s Kanteen, Bierhof Rüdersdorf has a stunning upper deck, which at night turns into a warmly lit chill-out spot where one can hear faint rumblings from the club. 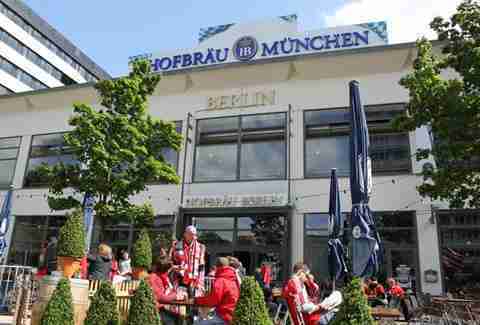 It's also a great place to warm up for the weekend of partying, but during the day it functions as a typical Berlin beer garden serving a combination of German-style beers/food.